Dr. K offers a Group Mentoring Program because given the huge time commitment, she can only work with a limited number of people privately. Enter the No Doubt Zone, get past FLAR (False Limitations Appearing Real), develop rock self confidence, and self-trust, for themselves and their clients, giving them the principles, process and tools to fulfill their biggest mission. This program isn’t for everyone, so before going into details, let’s be clear about who this program is for…and who it isn’t. 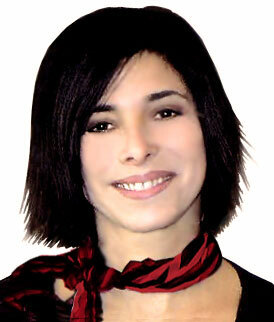 You get an integrative methodology (Kazlow Method) that goes deep to develop your self, your skills, and your practice. This is not a one size fits all program. You learn how to enter the No Doubt Zone and get your clients there as well. You learn to build your coaching practice with an approach that suits you. The mastery of the NDZ triangle, taught in this program, is key to becoming a 1% coach. 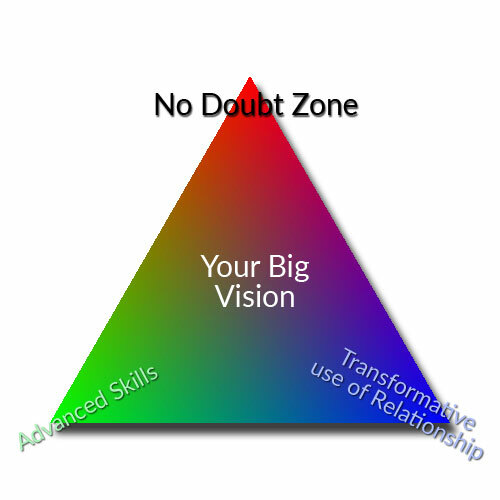 You, the coach, consultant or mentor, and your Big Vision, are in the center of the triangle. Deep work on yourself is necessary to get into the No Doubt Zone and achieve your desire to be a 1% coach. When you are in the NDZ, you can develop and apply advanced skills while using relationship most effectively toward the goal of transformation and fulfilling your biggest vision. Each aspect of the triangle is essential and works together to achieve the big vision. This model applied to helping you become a top 1% coach is the same model you will use with your clients – regardless of the coaching modality or niche you are in. The Kazlow Method is the most powerful way to pull this all this together to get you into the No Doubt Zone to achieve the results you want…for yourself and your client. Coaches will be asked to attend live, however in the event you must miss a call, calls will be recorded. Assignments and self-assessments focusing on deep personal work, client process and outcomes, practice building. We will have a private group where we’ll share questions, challenges, and successes. One live event in Westchester, New York. Space in our Mentoring Program for Coaches is limited. This course is not open at this time. If you are interested in getting on the waiting list for the next open position in 2019, please fill out the form below. We will contact you as soon as a position opens up. Why do you want to be/what does it mean to you to be a top 1 % coach, consultant or mentor? Tell me briefly about your practice, specialization and what you’ve achieved up until now as a coach, consultant or mentor. Why are you looking for a new way to move forward now? What do you want to create in the next 12 months as a coach, consultant or mentor? What are your top three client success stories in the past 90 days? What do you perceive to be the greatest obstacle holding you back from reaching your business or personal goals and fulfilling your biggest vision? How many paying clients do you have right now? How much is each client investing in their coaching with you? What is your target monthly income? ---I have the financial resources to invest in growingI can get the financial resources to invest inI can be get the resources in the next 3 monthsI don’t plan on making a significant investment in my business in the next 6 months.